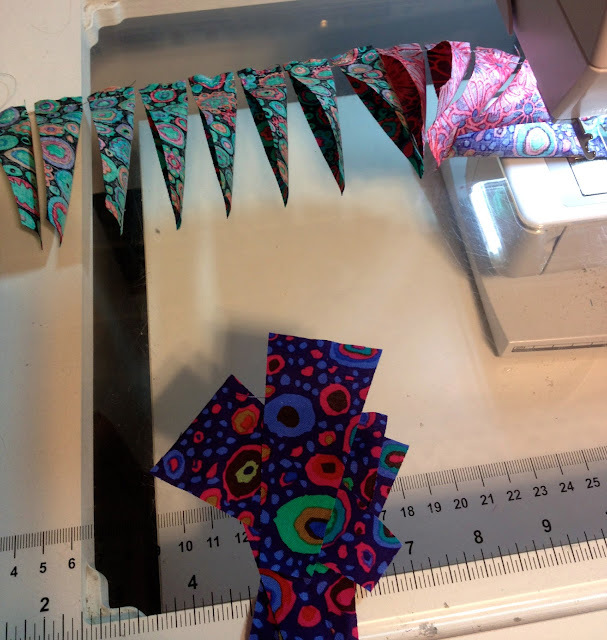 Sandra Kaye: Dare to Dresden Blog Hop!! Your mixed media Dresden is fantastic! Thank you for sharing and the great giveaway. I love all of the items, but the vintage ornament caught my eye. Beautiful dresden's- the mixed media piece is gorgeous! Your Mixed media canvas is incredible, I absolutely love it. You did a fantastic job. I would love to win that tote pattern! oh I love your beautiful canvas and your Kaffe Dresden. I like your quilts - great colours - and I really love your canvas I so keep meaning to do some mixed media art but never seem to get started - one day..... Thanks for sharing. i love kaffe fasset dresden! and that mixed media..very creative!Love it. I love your 1930's dresden - it's just beautiful. Love your mixed media Dresden and the kaffe one is delicious, gotta love kaffe! Lovely dresdens and thanks for the chance to win! Your Mixed media canvas is incredible... I love it so much... You did a wonderful job. I would love to win the vintage ornament pattern..
love your dresdens. If I could win I would like the Quattro bag pattern (I do love bags). Beautiful Kaffe dresden and I love your mixed media piece. Great work! Boy, you must have had FUN! I love your little quilt and your Kafka plate! That dresden plate is fantastic!! The 30's repro fabric Dresden is so sweet, but thne the Kaffe Fasset fabric Dresden is more my color style and that mixed media Dresden is wow! Oh if I could be lucky enough to win I would take the Quattro bag pattern. Thanks. Oh I just became your 300th follower too. I would choose the Quattro bag pattern if I am lucky enough to win, thanks. Wonderful! I have yet to try Dresdens, but they have always been my favorites.. 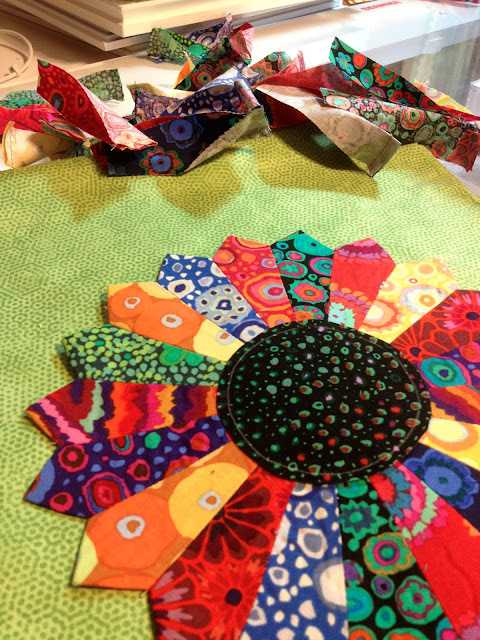 I just can't get to all of the quilts that I love.. YET!! I will get there.. I just have to live to be 100! LOL. I would love to win either #2 or #3. Thank you for the chance. Love your Dresden. Happy. Don't like your font --looks great but is hard for me to read. It is distracting to me. Your mixed media dresden is gorgeous. Would love the Quattro bag if my name is drawn. The mixed media dresden is gorgeous! you are truly talented! For the giveaway- I love surprises! I'm a big fan of Dresden Plate blocks... love your examples. And the journal page is wonderful! Thanks for a chance to win.. I'd choose the Quattro Bag pattern. I'm already a follower... and, after thinking about it for a minute, I'd still choose the Quattro bag. Your real Dresdens are just as beautiful as your scrapbook Dresden! Great job! Love your dresden quilt. so pretty and the new block is really neat too. Your canvas dresden is so awesome. thanks for sharing all your projects. If I were to win I would like the vintage ornament. thanks for a chance. Great dresdens - and I like your mixed media dresden too! I'm a happy follower! If I was lucky enough to win I'd prefer the bag pattern or the geese! Great dresdens and canvas is wonderful. Your have such talent. If I were to win, I would like the geese. I'm a new follower. As I was reading your post and saw the dresden canvas, my heart jumped ! I thought....oh I hope she's giving that away !!!!! Your work is so gorgeous I'll be back to visit often ! Little Miss Molly is most precious ! Love both of your projects! Like you, I enjoy a wide range of fabrics...from the 30's prints to the Kaffe prints! great Kaffe fabrics! they really make the dresden dance! However, I think your mixed media art steals the show! It is just beautiful. Love your creativity and thank you so much for sharing. LOVE your Dresdens. The canvas is absolutely BEAUTIFUL. Your Dresdens are beautiful - especially the one on canvas. Great idea. Nice! I'm a new follower. Mind. blown. Can't get over the tiny tiny dresdens. Wow. Love your canvas dresden, too! Good job all around! Okay...I love them all, but the Kaffe...Wow! That is an eye catcher! Great work, lady!! adore that mixed media piece... really stunning! thanks for hopping along! if it were possible, I'd follow you twice! wow, such a selection of dresdens. The mixed media one is so original! 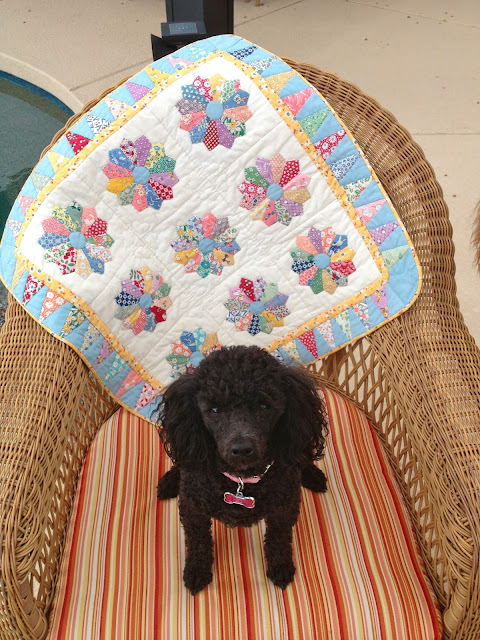 I like your first ever dresden quilt too - I spy a bunny! The new version is great, don't give up! All I can say is wow. You have totally blown me away with your dresedens. I love the colors of the new one espeically. they are so bright & vibrant. And the mixed media project is outta this world..I absolutely love it. If I won I would like the quattro bag pattern. It looks very cool & modern. You cannot go wrong with Kaffe. I don't think I would have it in me to do a whole quilt using Dresdens either. Love the pillow idea. I am now following via email. Love your projects. Love the quattro bag pattern. My little dachshund is also named Daisy.... I really like that mixed media project with the dresdens. Love the mixed media design...it's beautiful! As a matter of fact I just love them all! Thanks for sharing and thanks for the giveaway. love all of your dresdens! Your 30's Dresden really caught my eye since I'm a fan of those fabrics. If I were lucky enough to win your drawing, I'd love the vintage ornament pattern. Love your mixed media and love the 30s fabric dresedens. I am already a follower and love the purse pattern. Oh my!! Love the Dresden's you made!! 'Specially the Mixed Media one!!! What a beauty to hang on your wall!! You are Sooooo Talented!! Thanks for sharing...and chance to win your Drawing too! I would choose the Quattro Tote/Purse pattern...is way cool! 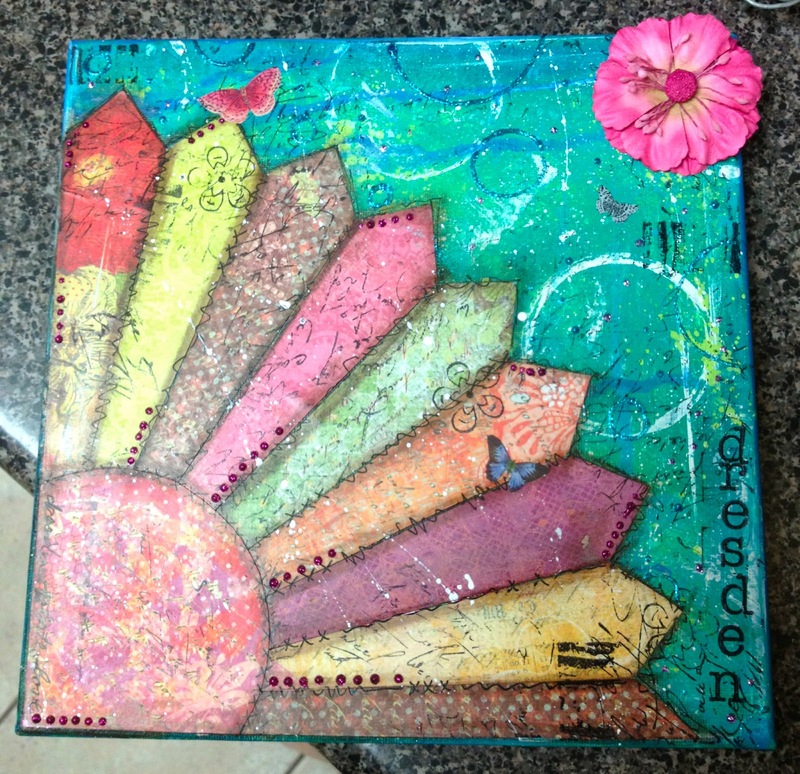 LOVE your mixed media project, it is gorgeous! Your projects are all so bright and colorful. Just the way I like them. 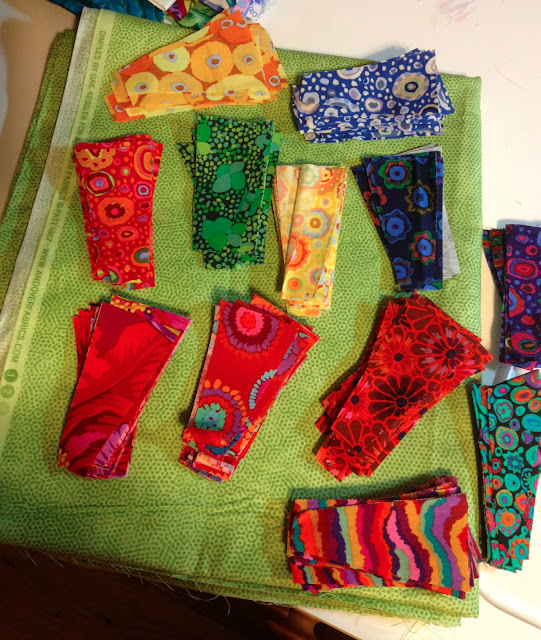 I just love using bright fabrics. I think I like the mini quilt best. Thank you for sharing and the chance to win. 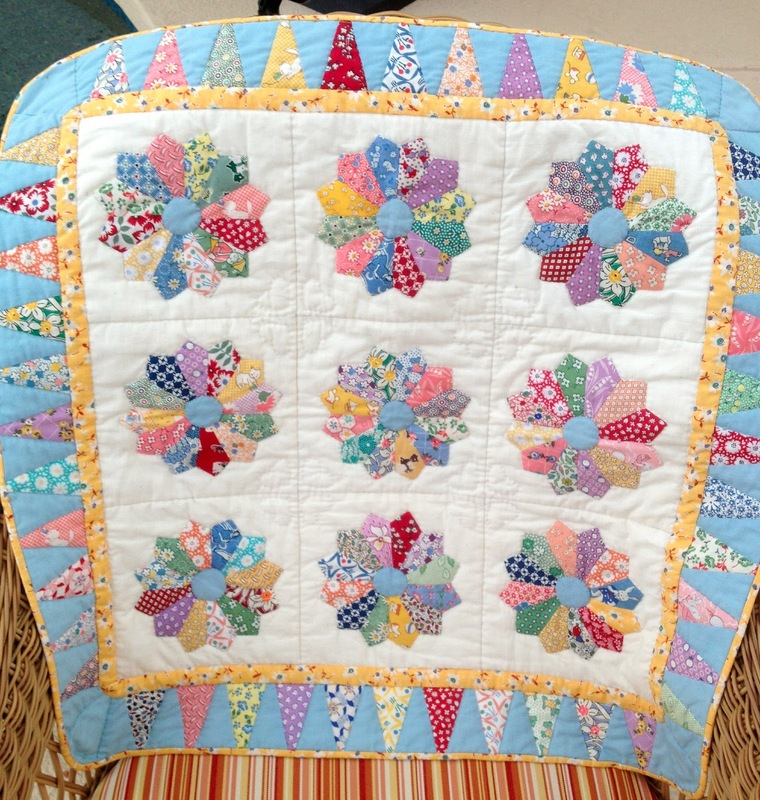 Your old quilt was so pretty and when I saw the Kaye fabrics, I knew the next one would be gorgeous and I was right! The mixed media dresdens are so pretty also. I love those little ornaments. I am an old follower through GFC. Your Kaffe dresden is gorgeous! I have been thinking of making one with his fabrics I have been collecting for a while. Your mixed media one is awesomely fabulous! I would love to have the bag if I win. Thank you! Your Dresden block is very pretty.But I LOVE reproduction fabrics, and when I saw your little quilt, I thought my heart would stop beating. LOL. It is so beautiful! Thank you for sharing and for the giveaway.--I like the bag pattern. 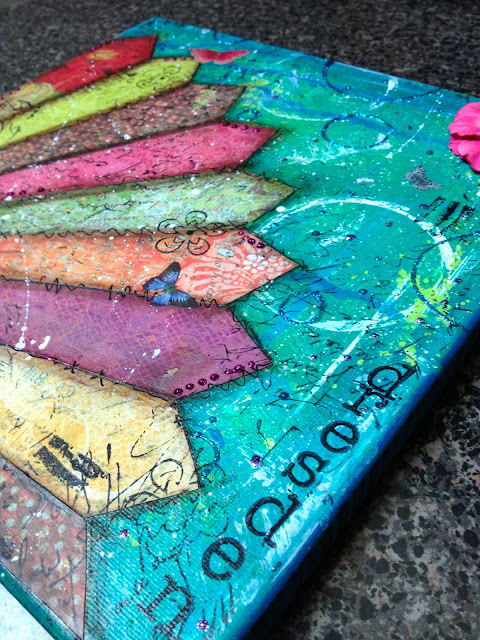 Love Love Love the mixed media! Would look awesome in my new sewing room. I would like the pattern for the The Quattro! Love the bright colours of your Dresden. I follow through google reader. I would love the bag pattern. Thanks. You are great at knowing when to throw in the towel. I'd just have put the project in a box and marked it and put in the closet, instead of making the block into a pillow. It is adorable. I like your Dresden from scrapbook paper. Very clever! You are generous to giveaway items you will never use. I have a few of the other Christmas ornaments, so that would be my first choice. The geese would be my second. I'm a new follower. I'm glad that you participated in the hop to inspire me and others. Nice work! Colors are fascinating and your artwork is wonderful! Your mixed media dresden is just outstanding art!!!! Rosemary B here: WOW you are good. I love the fabrics you have. This turned out very very lovely. Make a bunch of pillows, one for every one of your best friends. love your stunning dresden and the mixed media is spectacular.Thahnks for sharing!! I`m ahappy follower.Thanks for the chance!! Your scrapbook dresden is beautiful! Those little butterflies have given me an idea for a project. Umm, the Quattro tote should I get lucky. I love your Dresden but I really love you canvas creation. Cheery little dresden quilt. And I love the mixed media project. What a great idea! Thanks for the giveaway. I like the idea of passing on what you won't use. I'm all for the Quattro bag, then the ornament, and finally the geese. I like your colorful Dresden. And I like the green background. Thanks for the chance to win the Quattro pattern.I have made one of her bags, and like this one, but never bought it. I am your newest follower. Thanks for the chance to win the purse pattern, and for showing us your Dresdens. 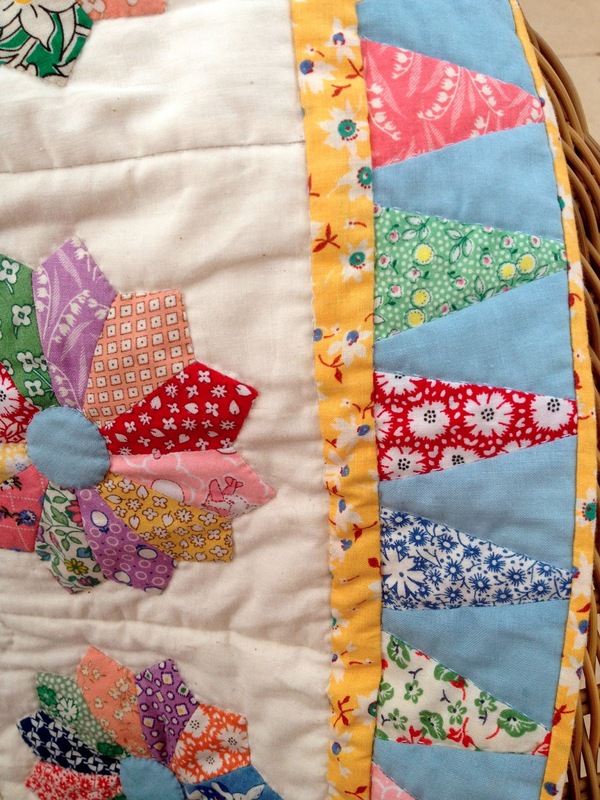 Hi Sandie your Dresden plate quilt is really lovely, I really like the border. The Dresden canvas is fabulous too. Love all your dresdens...your original one, the colorful Kaffe one, and the canvas art! You really embraced this challenge...well done! I am a follower and wold prefer the flying geese pattern if I won. Thanks for the chance! Beautiful quilt! I'm currently hand quilting a Dresden plate quilt top my grandma made in the 1930s. It's only about a king size. Shouldn't take too long to do. Right? I would love the pattern of the wild geese. Love the mixed media Dresden. Such great creativity! I'll be poking around to see what else you have in the mixed media dept. I love mixing things up! I'm not picky... I guess first choice would be the ornament, but certainly wouldn't throw a fit if one of the other prizes landed on my doorstep :) Thank you for sharing! Loved the 30s fabrics in the little quilt but the bright fabrics of today are marvelous, too. It will make a lovely pillow. Your artwork is outstanding. WOW - that is TOO COOL!! I'm now a follower - thank you! Beautiful Dresdens! Your mixed media is fantastic! Thanks for participating and inspiring us! I would love The Quattro. thanks for the change to win! I love your baby Dresdens. Thanks for sharing. I would love to win the bag pattern in the center. I am a follower! I look forward to reading your post! The Quattro is my favorite! Thanks for the giveaway! Your creations are wonderful! Your Dresden has inspired me to purchase a ruler and give this a try. Thank you for sharing. The Flying Geese really caught my attention; I am attempting to improve all aspects of half square triangles. I also signed up to follow your blog. Looking forward to reading more. Who doesn't love Kaffe! Thanks for sharing the dresdens and the giveaway! Sign me up for the Quatto bag! I'm a new follower by email. Thanks for another chance at that Quatto bag pattern! Great work on the Dresdens. I especially like you mixed media project. So beautiful. I'm a follower via GFC. 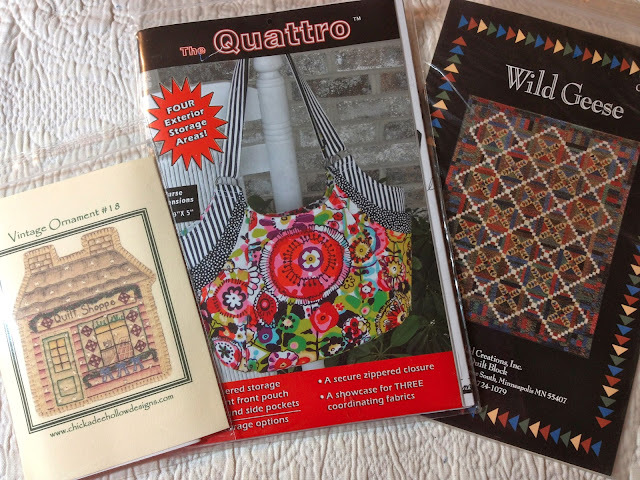 I would love to win the Quattro Bag Pattern. Your Dresden is great - and your mixed media Dresden is over-the-top awesome!!! If I were so lucky to have you pull my name, I'd love the Quattro pattern! Thank you so much for the opportunity! I am a follower of your creative blog! I love the fabrics you've chosen for your Dresden - fantastic! And the artwork is wonderful too. You are very talented! I am a new follower - love your blog! If my name is drawn, I'd enjoy having the Quattro pattern. Love your ideas...thank you for sharing! Wow, the Kaffe fabrics make a beautiful Dresden! I think my favorite is the 1930 mini plates. It is so sweet for a baby! Love the Dresden in the old prints. I think you just inspired me to use a Dresden to make some sewing machine covers for my babies. Great Blog I am a new follower. 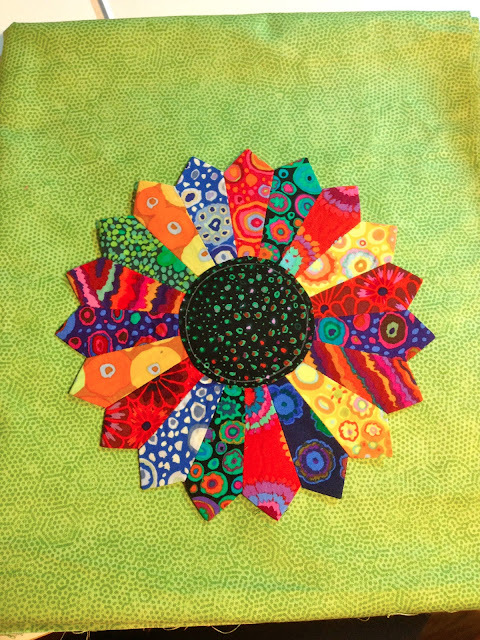 I love the new Dresden Plate Pillow you made - love the modern colors. And I love the paper one too. Great job on that! 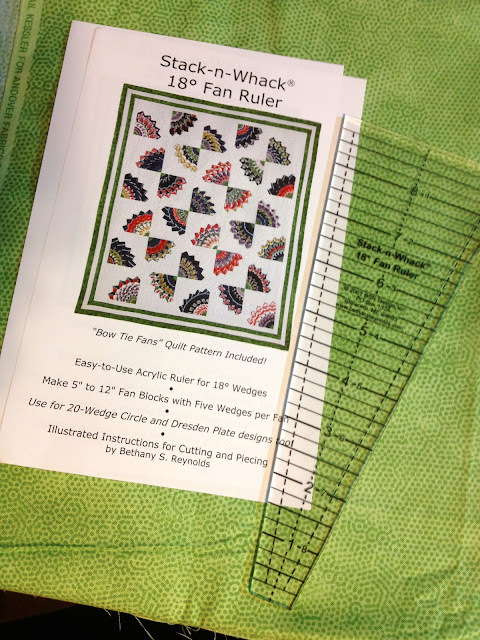 I've always wanted to make the stack n wack quilt pattern you have. So it's cool to see you made something from it. I love your fabric choices--also, the mixed media piece is great. Wonderful work. I think the 2nd pattern looks interesting. Thanks for sharing, love your dresdens! Your mixed media piece totally rocks! Oh my goodness it's so gorgeous! Love it! p.s. don't enter me in the giveaway I have more than I can do right now. Let somebunny else enjoy. 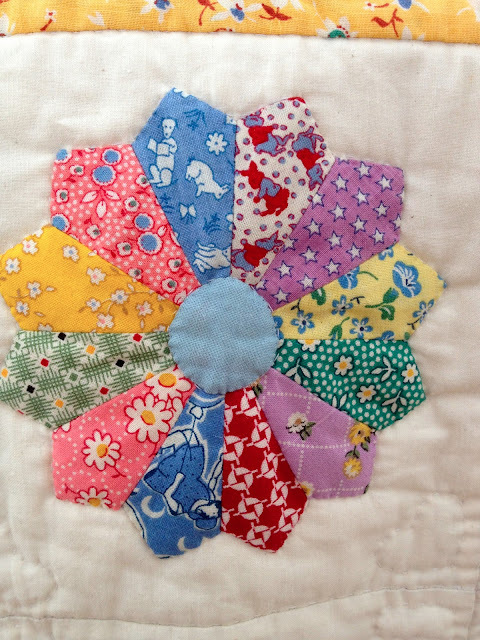 Your mini quilt is lovely, as is its model! I think your Kaffe will make a great pillow. You have such a great talent as seen in your mixed media- lovely. If picked, I would like the flying geese pattern. I love the colours in your Kaffe dresden and it will make a lovely pillow. Your mixed media dresden is beautiful! Thanks for the giveaway. I would choose the Quattro. I loved your art work! Thanks for being part of the hop. Love those canvases Sandie - so bright and wonderful. Such a great idea to transfer the pattern. I'm a new follower! I'm really loving your Dresdens! You'll have wonderful pillows!! All your work is beautiful. I'm looking forward to reading lots of future and past posts as well!